Up for grabs to anyone interested, Venom #1 AMC Movie variants. 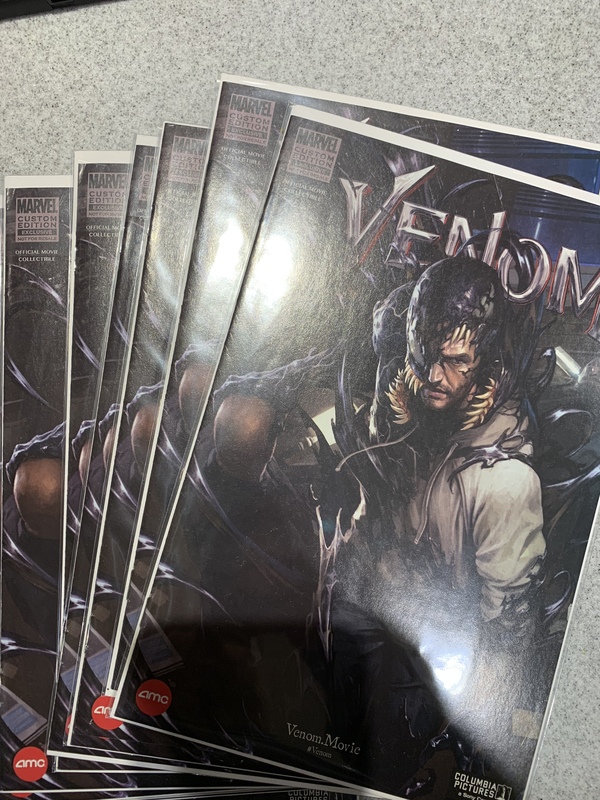 I have 19 copies of the Venom #1 AMC movie variant. From time to time I try to offer up cool giveaways and other deals when I can find them. I know these were initially hard to find, so when I came across a stack of them at AMC, I thought I would grab them. $3 each plus $3.99 Shipping. They are light so I can do 2 copies at the 10 ounce shipping. Post in comments if you are interested and email at apopcomics@gmail.com to arrange payment. They did come from a non-comic source so they are not 9.8’s but I grabbed the best ones they had left. All Copies have been paid for and claimed. Thank you all for the interest I knocked them out in order in which they came. Definitely interested. 5 copies for me please. I would like one. Email already sent. Still room for 2 copies? I have been updating it as I sell them, yes, email me, they are going quick. I’ll take one if any are left. Thanks. I’ll take one if possible! By, “Take,” I of course mean I’ll pay you. It would be nice to have an actual opportunity to get these. giving 5 copies to one person? guess not. I didn’t give five copies to anyone. I gave people the opportunity to get one or two copies. Some people asked for two. Others asked for just one. All gone as of last night. Sorry. Anthony, let me know if any are still available, please. Received my copy today in better condition than expected and very well packed! Thanks! Thanks for reporting back. I switched from Gemini II boxes to the ones from Matt’s baseball and was happy with them. Saved a couple of bucks on the 100 I order every month/ every other month.